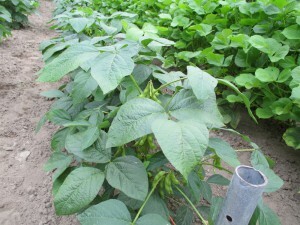 Manitoba Brown is one of the soybeans I trialed in 2014. This variety was developed by the Manitoba Agricultural College prior to 1922. It is very adaptable to northern climates and has high yields. It is a sem-determinate variety that reaches 18” to 24” in height. The plants are stocky and erect in stature. Works as a dry bean or fresh as edamame. The harvested beans were free of blemishes and splits. Excellent flavor as a baked bean, or used in soups! The grow out for 2015 was excellent. No issues with lodging or disease. That is exciting given the excessive amount of rain we had from spring through mid-summer. The maturity was 95 days. Seed quality was excellent with the exception of a small percentage of small seed. There is always a degree of variability with heritage beans that have not been selected for a number of years (Jet Black and Shinonome would be examples of soybeans with very little variability in bean size). Manitoba Brown can also be used as an edamame.